Judicial Magistrate, Ramanathapuram, dated 21.09.2011 made in M.C.No.2 of 2010. An interesting question, as to whether a woman, against whom a decree dissolving her marriage has been passed by the Civil Court on the ground of adultery, is entitled for maintenance under Section 125 of the Code of Criminal Procedure from her divorced husband, has arisen for consideration. 2. In this case, the respondent herein is the divorced wife of the petitioner. The marriage between them was celebrated on 01.02.1998, as per the Hindu Rites and Customs. Out of the said wedlock, they have got children also. Shortly, after sometime of the marriage, there arose misunderstanding between them and the marital life was not successful. The petitioner alleged that even prior to the marriage, the respondent was living a wayward life, which she continued even after her marriage. In short, according to the petitioner, the respondent was living in adultery. On the said ground, the petitioner filed H.M.O.P.No.571 of 2009, before the Family Court, Madurai, seeking divorce. The respondent remained ex-parte in the case. Consequently, the Civil Court granted decree for divorce dissolving the marriage, precisely on the ground that the respondent was living in adultery. During the pendency of the said matrimonial dispute before the Family Court, the respondent filed M.C.No.2 of 2010 before the learned Chief Judicial Magistrate, Ramanahtapuram, claiming maintenance under Section 125 of the Code of Criminal Procedure, [for brevity, “the Code”], at the rate of Rs.2,500/- per month. 3. Before the Chief Judicial Magistrate, the respondent herein alleged that the petitioner herein had developed illicit intimacy with his sister’s daughter, by name, Muthulakshmi and the petitioner wanted consent from the respondent for marrying the said Muthulakshmi, as his second wife. Since the respondent was consistently refusing to give consent, she was harassed and sent out of the matrimonial home, she alleged. She further alleged that the allegation that she was living in adultery, as contended in H.M.O.P.No.571 of 2009, was utter false. She further alleged that despite the decree for divorce granted by the Civil Court, as the divorced wife, she is entitled for maintenance. She further contended that the petitioner is in Government Service with a monthly salary of Rs.15,000/- per month and therefore, he is liable to pay a sum of Rs.2,500/- to her towards her maintenance. 4. During the trial of the said case before the learned Chief Judicial Magistrate, the respondent herein examined herself as PW-1 and as many as three documents were exhibited, i.e., the statement made by the petitioner herein before the police in connection with an enquiry held into a petition presented by the respondent, a copy of the statement made by the respondent before the police and a copy of H.M.O.P.No.571 of 2009. On the side of the petitioner herein, he examined himself as RW-1, wherein he had reiterated his stand that the respondent was living in adultery and that she was not, therefore, entitled for maintenance. One Mr.Muthuramalingam was examined as RW-2, who has spoken about the panchayat held to resolve the matrimonial dispute between the petitioner and the respondent, in which, according to him, Sreethana properties were taken back by the respondent and she expressed her desire to live separately. According to him, EX-P1 is the written undertaking given by the respondent; EX-P2 is the acknowledgement for having taken back the Sreethana properties; EX-P3 is the LIC Policy and EX-P4 is the marriage invitation of Mrs.Muthulakshmi. 5. During the pendency of the trial of the maintenance case, the Civil Court granted decree for divorce in H.M.O.P.No.571 of 2009, on 12.03.2010. Having considered all the above evidences, the Trial Court, by order dated 21.09.2011 dismissed M.C.No.2 of 2010. Aggrieved over the same, the respondent filed a Revision before the learned Principal District and Sessions Judge, Ramanathapuram, in Cr.RC.No.22 of 2011. The learned Principal District and Sessions Judge, by order dated 27.01.2012, allowed the said revision, set aside the order of the Trial Court and directed the petitioner to pay a sum of Rs.1,000/- per month towards her maintenance. Challenging the said order, the petitioner is now before this Court with this Criminal Revision Case. 6. I have heard Mr.G.R.Swaminathan, the learned counsel appearing for the petitioner, Mr.G.Prabhu Rajadurai, the learned Legal Aid Counsel appearing for the respondent and I have also perused the records carefully. 7. In this Criminal Revision Case, the foremost contention of the learned counsel for the petitioner is that once if the Civil Court has granted decree for divorce on the ground that the wife was living in adultery, then, as per sub-Section 4 of Section 125 of the Code, she loses her right to claim maintenance from her former husband. The learned counsel would refer to sub-Section 4 of Section 125 of the Code to substantiate the said contention. According to him, the term “adultery”, as employed in sub- Section 4 of Section 125 of the Code, is applicable even to a divorced wife, whose marriage was dissolved on the ground of adultery. The learned counsel would further submit that so far as the ground of adultery is concerned, the disqualification arising out of the same is everlasting and the said disqualification will not cease to exist, after the woman has changed her course from the path of adultery. He would further submit that the decree, granted by the Civil Court, in the instant case, though is an ex-parte decree, binds the parties as well as the Criminal Court. Thus, according to the learned counsel, the respondent is not entitled for maintenance from the petitioner. 8. Mr.G.Prabhu Rajadurai, the learned counsel appearing for the respondent, would vehemently oppose this Criminal Revision Case. According to him, though an ex-parte decree of divorce granted by the Civil Court is binding on the parties, the same would not bind the Criminal Court, while considering the question of granting maintenance for the divorced wife. He would further submit that the term “adultery” is applicable only to a wife whose marriage is still in subsistence. In other words, according to the learned counsel, after the divorce, the wife is at liberty to choose her own way of sexual life, which is her liberty and therefore, such intimacy with a man would not fall within the term “adultery”, as referred to in the said provision. The learned counsel would, therefore, submit that sub-Section 4 of Section 125 of the Code is not applicable to a divorced woman, as the same is applicable only to a woman whose marriage is still subsisting. 9. I have considered the above submissions. As per sub-Section 1 of Section 125 of the Code, if any person having sufficient means neglects or refuses to maintain his wife unable to maintain herself, a Magistrate of the first class may upon proof of such neglect or refusal, order such person to make a monthly allowance for the maintenance of his wife. Explanation ‘b’ appended to the above said provision states that the wife includes a woman, who has been divorced or has obtained divorce from her husband and has not re-married. It is too well settled that the Explanation appended to the main part of the enactment becomes a part and parcel of the said provision itself, [vide Bengal Immunity Co Ltd., Vs. State of Bihar, reported in AIR 1955 SC 661 : 1955 (2) SCR 603]. Therefore, a conjoint reading of sub-Section 4 of Section 125 of the Code with Explanation ‘b’ would make it manifestly clear that a divorced woman, who has not re-married, is entitled for maintenance from her former husband. 11. The term “wife”, as employed in sub-Section 4 of Section 125 of the Code, shall undoubtedly include a divorced wife also. This is manifest from the Explanation, which states that for the purposes of this Chapter, wife includes a woman, who has been divorced. It is noticeable that this Explanation is not for the purpose of sub-Section 1 of Section 125 of the Code alone and it is for the purpose of the whole Chapter IX, which includes sub-section 4 also. This provision speaks of three situations, i.e., living in adultery, or without any sufficient reason, if the wife refuses to live with her husband or if they are living separately by mutual consent. In the instant case, we need not go into the latter two situations, as we are concerned only with the first situation, i.e., living in adultery. The term ‘adultery’ is used in that Section in the ordinary sense, that is, a married man having sexual connection with a woman who is not his wife. It appears to me that this construction is not affected by the last words of Section 4 of the Criminal Procedure Code, but is consistent with it. 13. As held by the Full Bench, the term “adultery” as employed in sub- Section 4 of Section 125 of the Code should receive a liberal interpretation to give its ordinary sense, i.e., a married woman having sexual connection with a man, who is not her husband. For the purpose of sub-Section 4 of Section 125 of the Code, the term “wife” cannot be confined only to the wife whose marriage is still subsisting, in view of the Explanation of the term “wife” for the purpose of the entire Chapter. Therefore, even after a decree for divorce is granted, if the wife wants to retain her right to claim maintenance from her former husband, she is expected to continue to maintain the same discipline, as she was expected to maintain during her marital ties, after the snapping of the marital ties also. In other words, during the subsistence of the marriage, the wife cannot live in adultery and in the event she lives in adultery, she loses her right to claim maintenance from her husband; similarly, even after the divorce, if she continues to maintain the same discipline, she will continue to retain the right to claim maintenance from her former husband. If she commits any breach of the said obligation and starts living in adultery, i.e., having sexual relationship with another man, she will lose her right to claim maintenance. 14. The very object of introducing the Chapter IX in the Code for maintenance of wife, children and parents is to rescue them from destitution by extending monetary assistance. Even after the divorce, the law takes care of her that she should not end up in destitution and that is the reason why, according to the Explanation, she is entitled for maintenance from her erstwhile husband, even after such divorce. Since the man carries the obligation to maintain his divorced wife, the woman also carries the obligation not to live in relationship with another man. If she commits breach and starts to live in relationship with another man, she will suffer disqualification from claiming maintenance, as dealt with in sub-Section 4 of Section 125 of the Code. If she wants and starts to live in relationship with any other man, she may be entitled for maintenance from him and not from the former husband. treated as a bar to her claim for maintenance as a divorced wife. decisions as they represent the correct legal position. the mutual rights, duties and obligations should also come to an end. 16. Placing much reliance on the said Judgment, the learned counsel contended that sub-Section 4 of Section 125 of the Code is not applicable to a divorced wife. But, the said Judgment cannot be generalized so as to make it applicable to the case of a divorced wife living in adultery also. So far as the desertion is concerned, sub-section 4 states that if the wife, without any sufficient reason, refuses to live with her husband, then, she is not entitled for maintenance. The Hon’ble Supreme Court took the view that after a decree of divorce is granted, it is not possible for the wife to live with her husband and therefore, according to the Hon’ble Supreme Court, sub- Section 4 of Section 125 of the Code is applicable only to a wife whose marriage is in subsistence. But, so far as adultery is concerned, in my considered view, the above Judgment cannot be made applicable, because even after the decree of divorce, the divorced wife carries the obligation not to live in relationship with any other man. 17. In Smt.Vanamal Vs.Shri H.M.Ranganatha Bhatta, reported in 1995  SCC 299, the Hon’ble Supreme Court was confronted with a similar situation. That was a case, where a decree for divorce was obtained by mutual consent under Section 13(b) of the Hindu Marriage Act, 1955. In the said case, when the wife claimed maintenance, the Hon’ble Supreme Court has held that sub- Section 4 of Section 125 of the Code is applicable only to a wife whose marriage is still in subsistence and the same is not applicable to a divorced wife by mutual consent. Here again, a divorced wife cannot live with her former husband and there is no question of her taking the consent of her former husband to live separately. That is the reason why, the Supreme Court has held that for a divorced wife sub-section (4) of Section 125 of the Code of Criminal Procedure is not applicable. Thus, this Judgment is also not applicable to living in adultery by her. to be committed, it amounts to miscarriage of justice”. 19. In the instant case, the decree granted by the Civil Court is an ex-parte decree on the ground that the wife was living in adultery and the said ex-parte decree though binding on the parties, is not binding on the Criminal Court, it is contended. In order to substantiate the said contention, the learned counsel has made reliance on the Judgment of this Court in K.Senthilanathan Vs. Jaichitra, [Crl.RC.No.771 of 2010, decided on 02.08.2010. A close reading of the said Judgment would go to show that the learned Judge has not laid down any law on the above legal issue. He has made only a passing remark and therefore, the same does not take the shape of a binding precedent. find no illegality or error in the learned Sessions Judge holding so. by the learned Sessions Judge”. 22. In view of Section 41 of the Indian Evidence Act, 1872, if once the decree for divorce is granted on the ground of adultery, such finding is relevant for deciding the issue of adultery in the present case. This Court cannot sit in an appeal over the said decree for divorce granted by the Civil court, when the same has not been challenged by the aggrieved party. There can be no difference between a decree on contest and an ex-parte decree, since, like a decree on contest, an ex-parte decree is also a decree passed on proof of the claim made by means of sufficient evidence. It is well known that though simply because the defendant has remained ex-parte, the Court shall not grant decree, unless the claim made in the plaint is proved, by means of evidence either oral or documentary or both. In the case on hand, therefore, there can be no doubt that the decree for divorce granted by the Civil court in favour of the petitioner is sufficient proof that the respondent was living in adultery. When once such a decree is in force, it is not possible for this Court to take a different view contrary to the decree granted by the Civil court. Therefore, I hold that besides, oral evidence let in, in this case, the decree granted by the Family Court clearly goes to prove that the respondent is living in adultery and thus, she suffers from the disqualification to claim maintenance from the petitioner. 23. In view of the foregoing discussion, I hold that the learned Principal Sessions Judge was not right in reversing the order of the Trial Court and therefore, the order of the learned Principal Sessions Judge impugned in this Criminal Revision Case is liable to be set aside. 24. In the result, this Criminal Revision Case is allowed, the order, dated 27.01.2012, made in Crl.R.C.No.22 of 2011, passed by the learned Principal District Judge, Ramanathapuram, is set aside and that of the order of the learned Chief Judicial Magistrate, Ramanathapuram, dated 21.09.2011, made in M.C.No.2 of 2010, is restored. 1.The Principal District Judge, Ramanathapuram. 2.The Chief Judicial Magistrate, Ramanathapuram. This entry was posted in Adultery, Madras HC, Maintenance, maintenance denied and tagged Adultery, Madras HC, Maintenance, Maintenance to adulterous wife, No maintenance to Adulterous wife on July 30, 2015 by vinayak. Along with Shanmugasundari, one V Ganesh Prabhu, who was allegedly her agent, and Arun Kumar, who had obtained a fake certificate, have also been arrested. This entry was posted in where is the evidence on July 26, 2015 by vinayak. Police Addl. Commissioner’s wife files dowry case Seeks CB CID inquiry & 1.5 crores only !! Wants office sacked !! CHENNAI:The wife of an IPS officer, serving in the city, has demanded a CBCID inquiry into the dowry harassment charges that she earlier made against her husband. This was her fresh complaint filed with the Director General of Police (DGP) on Monday. Speaking to the media, Meghana said the actions on her previous complaint were unsatisfactory and demanded a fair probe by a senior CBCID official to ensure justice to all the harassment she had faced. “I genuinely expect the FIR to be registered for the offences under section 498-A, 406 IPC against my husband, his parents CR Bunkar and Vidhya Bunkar in this case,” she said in her complaint. Meghana also expressed disappointment with the action taken on her previous complaints. Subsequently, she was called for an inquiry into her complaint and narrated everything to the Additional Commissioner of Police (HQ-City Police) R Thirugnanam. In the latest complaint, she has made serious allegations with regard to her husband’s service. She had earlier accused the officer of dowry harassment besides other cruel acts in a petition to the DGP and the Commissioner of Police. The woman stated in her petition that from the time she got married in 2004 till the time she was forced to leave her husband on June 11, 2015, her husband never gave her any maintenance. Further, she noted that she had to take up part-time jobs in various colleges in order to support herself and her 9-year-old son. She said that her husband – Santosh Kumar, Deputy Commissioner of Police, Greater Chennai, only gave her two meals a day and a roof over her head. 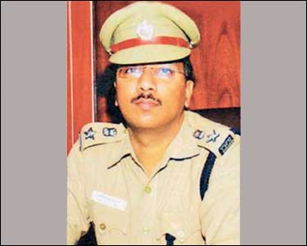 Meghana said the IPS officer did not stop with taunts and verbal jibes on dowry, but inflicted immense mental harassment and cruelty upon her. She noticed that her husband’s family endorsed his actions and were planning for his remarriage. Given the brazenness of the IPS officer, the woman said he should not be allowed to sit in office as a custodian of law. மனைவியின் புகாருக்கு, துணை கமிஷனர் சந்தோஷ்குமார் தனது கண்களில் பொங்கிய கண்ணீரை மட்டுமே பதிலாக சொல்கிறார். அவரிடம் வேலைபார்க்கும் போலீஸ்காரர்கள், அவரது உறவினர்கள், நண்பர்களிடம் விசாரித்தபோது, பரபரப்பு தகவல்களை வெளியிட்டனர். சென்னை போலீஸ் துணை கமிஷனர் சந்தோஷ்குமார் மீது அவரது மனைவி திடுக்கிடும் குற்றச்சாட்டுகளைச்சொல்லி, அவர் மீது வழக்குப்பதிவு செய்ய வேண்டும், இதுதொடர்பாக சி.பி.சி.ஐ.டி. போலீஸ் விசாரணைக்கு உத்தரவிட வேண்டும் என்று டி.ஜி.பி. அலுவலகத்தில் நேற்று புகார் மனு ஒன்றை கொடுத்தார். இதுபற்றி சந்தோஷ்குமாரிடம் கேட்டபோது, அவரது கண்களில் இருந்து கண்ணீர் பொங்கி எழுந்து வடிந்தது. வேறு எந்த தகவலையும் அவர் சொல்லவில்லை. எல்லாவற்றையும் கடவுள் பார்த்துக்கொள்வார் என்று சைகை மூலம் மேல்நோக்கி கையை காண்பித்தார். அவர் மீது, அவரது மனைவியால் கூறப்பட்டுள்ள குற்றச்சாட்டுகள் பற்றி, அவரிடம் வேலை பார்த்த போலீஸ்காரர்கள், அவரது நண்பர்கள், சக போலீஸ் அதிகாரிகள், உறவினர்கள் சிலரிடம் விசாரித்தபோது பரபரப்பு தகவல்கள் கிடைத்தன. சந்தோஷ்குமாரைவிட, அவரது மனைவி மேகனா வசதியான குடும்பத்தில் பிறந்தவர். இருவரும் ராஜஸ்தான் மாநிலத்தைச் சேர்ந்தவர்கள். மேகனாவின் குடும்பம் அரசியல் பாரம்பரியம் மிக்கது. அவரது தாத்தா ராஜஸ்தான் மாநிலத்தில் அமைச்சராக பணியாற்றியவர். அவரது தந்தை தற்போது பாரதீய ஜனதாவில் முக்கிய பிரமுகராக உள்ளார். அவரது நெருங்கிய உறவினர் பஞ்சாப் மாநிலத்தில் காங்கிரஸ் எம்.பி.யாக இருக்கிறார். கடந்த 10½ ஆண்டு குடும்ப வாழ்க்கையில் சந்தோஷ் வீட்டிலும் அவரது மனைவிக்கும், அவருக்கும் பிரச்சினைகள் வெடித்தன. இது அந்தஸ்து, பண வசதி, ஆடம்பர வாழ்க்கையை அடிப்படையாக வைத்து எழுந்த பிரச்சினைதான். சந்தோசுக்கு சென்னை போலீசில் பதவி கிடைத்த பிறகுதான், அவரது மனைவியுடன் பிரச்சினை புகைய ஆரம்பித்தது. சந்தோஷ் நேர்மையான அதிகாரி. அரசு கொடுக்கும் சம்பளத்தில் சந்தோஷமாக, சிக்கனமாக வாழ நினைப்பவர். அவரது மனைவி வசதியான குடும்பத்தில் பிறந்தவர் என்பதால், அவர் எதிர்பார்த்த வசதி, வாய்ப்புகளை சந்தோஷால் செய்து கொடுக்க முடியவில்லை. இதுதான் சண்டைக்கு மூலகாரணம். அடுத்து சந்தோஷின் பெற்றோருக்கும், மேகனாவின் பெற்றோருக்கும் உள்ள கருத்து வேறுபாடும், பிரிவினையை வளர்த்தது. கடந்த ஒரு மாதமாக இருவரும் பிரிந்து விட்டனர். மேகனா, ராஜஸ்தான் மாநில தலைநகர் ஜெய்ப்பூரில் உள்ள தனது தந்தை வீட்டுக்கு சென்றுவிட்டார். ஜெய்ப்பூரில்தான் இவர்களின் மகன் படிக்கிறான். கடந்த 6–ந்தேதி சந்தோசை ஜெய்ப்பூருக்கு அழைத்து சென்றோம். அவர் அங்கு 4 நாட்கள் தங்கி இருந்தார். மனைவி மேகனாவிடம் நண்பர்கள் வாயிலாக சந்தித்து பேசினார். பிரச்சினைகளை பேசி தீர்த்து கொள்ளலாம் என்று மேகனாவை சென்னைக்கு அழைத்தார். ஆனால் மேகனா, சந்தோசுடன் சேர்ந்து வாழும் திட்டத்தை ஏற்கவில்லை. மாறாக பிரிவு உறுதி. தனக்கும், தனது மகனின் எதிர்கால செலவுக்கும் ரூ.1½ கோடி பணமாக கேட்டார். அந்த பணத்தை கொடுக்காவிட்டால், சட்டரீதியாக நடவடிக்கை எடுப்பேன் என்று மேகனா உறுதியாக கூறிவிட்டார். நான் சினிமா நடிகரோ, தொழில் அதிபரோ, லஞ்சம் வாங்கும் ஊழல் அதிகாரியோ இல்லை, இதனால் தன்னால் ரூ.1½ கோடியை தர இயலாது என்று கூறிவிட்டார். இதனால் பிரச்சினை டி.ஜி.பி. அலுவலகம் வரை சென்று விட்டது. சந்தோஷின் நேர்மை, அவரை காப்பாற்றும் என்ற நம்பிக்கையோடுதான் நாங்கள் இருக்கிறோம். சந்தோஷ்குமார் வீடு, நிலம் வரதட்சணையாக கேட்டார் என்ற குற்றச்சாட்டு ஆச்சரியம் தருவதாக உள்ளது. ஏனென்றால், அவர் சென்னை நெற்குன்றத்தில் அரசு கட்டித்தரும் வீட்டுக்கு ரூ.64 லட்சம் கடனாக வாங்கி கொடுத்துள்ளார். இதற்கு அவர் அரசிடம் ரூ.40 லட்சம் கடன் பெற்றுள்ளார். இதற்கு மாதம் தோறும் அவர் ரூ.40 ஆயிரம் தனது சம்பளத்தில் இருந்து கட்டுகிறார். இதனால் அவர் ரூ.28 ஆயிரம்தான் மாத சம்பளம் வாங்குகிறார். இந்த பணத்தில்தான் அவர் குடும்பம் நடத்தும் கட்டாயத்தில் இருக்கிறார். இதுவும் இந்த பிரச்சினைக்கு ஒரு அடிப்படை. சந்தோஷை போன்ற ஒரு நேர்மையான அதிகாரிக்கு இதுபோன்ற பிரச்சினை ஏற்பட்டுள்ளது, வருத்தமாக உள்ளது. அவர் உண்மையிலேயே தனது மனைவியை அடித்து துன்புறுத்தி இருந்தது விசாரணையில் கண்டறியப்பட்டால், கண்டிப்பாக அவர் உரிய தண்டனை பெறவேண்டும். அதிகம் பேசாதவர். கடுமையான சிக்கனவாதி. சொகுசு வாழ்க்கையை விரும்பாதவர். இதுதான் சந்தோஷ்குமாரின் அடிப்படை குணம். அவருக்கும், அவரது மனைவிக்கும் உள்ள பிரச்சினையை பெரிதாக்கியது, அவரை பிடிக்காத சில போலீஸ் அதிகாரிகள் செய்த சதிதான். இப்போதும் அந்த அதிகாரிகள் பின்னணியில் இருந்துதான், பிரச்சினையை வளர்த்து விடுகிறார்கள். மகனை கடத்தும் குற்றத்தை சந்தோஷ்குமார் ஒருபோதும் செய்யமாட்டார். சமீபத்தில் கூட ராஜஸ்தான் மாநிலம் சென்றிருந்தபோது, மகனை பார்க்க மேகனா அம்மா அனுமதிக்கவில்லை என்றும், பள்ளிக்கு சென்று தலைமை ஆசிரியரின் அனுமதியுடன், மகனை ரகசியமாக பார்த்ததாக சந்தோஷ்குமார், எங்களிடம் சொல்லி வருத்தப்பட்டார். இந்த பிரச்சினையில், சந்தோஷ்குமாரிடமும் விசாரணை நடத்தப்படும் என்று தெரிகிறது. This entry was posted in where is the evidence on July 21, 2015 by vinayak. * Why was the complaint filed ?? Quoting from order below : “….It is alleged that the unfortunate incident took place as respondent No.2 refused to send his wife to the birthday party of her brother, which led her to take the extreme step……” !! 1. Rule. Mr.L.B.Dabhi, learned Additional Public Prosecutor, waives service of notice of Rule for respondent No.1. Mr.Anil C.Thakore, learned advocate, waives service of notice of Rule for respondent No.2 (complainant). Considering the facts and circumstances in which the matter arises, it is being heard and decided finally, at this stage, with the consent of the learned counsel for the respective parties. 2. This application under Section 482 of the Code of Criminal Procedure, 1973 (“the Code”) has been preferred by the applicants for quashing and setting aside the complaint filed against them, being C.R.No.I­204/2014, before Vatva Police Station, Ahmedabad, for offences punishable under Sections 306, 498A and 114 of the Indian Penal Code as well as Sections 3 and 7 of the Dowry Prohibition Act, 1961, and further consequential proceedings arising out of the same. It is also prayed to order release of applicant No.2 from the Central Jail, Sabarmati, in connection with the said offence. 3. It is the case of the prosecution, based upon the compliant submitted by respondent No.2 that the marriage of the daughter of the complainant took place with applicant No.2 on 24.02.2012 as per the rites and rituals of the community. The complainant gave Rs.2 lakhs in cash, 5 tolas gold, motorcycle, T.V., refrigerator, sofa­set, and other articles to his daughter at the time of marriage. However, applicant No.2 further demanded an amount of Rs.10,000/­ at the time of marriage, which was given by the complainant. It is alleged that the demands were reiterated and applicant NO.2 used to ask for the day­to­day expenditure from respondent No.2. The daughter of respondent No.2 opposed this conduct of the applicants which led to physical and mental torture and harassment being inflicted upon her. It is alleged that the unfortunate incident took place as respondent No.2 refused to send his wife to the birthday party of her brother, which led her to take the extreme step. 4. It is the case of the applicants before this Court that the matter has now been amicably resolved between them and respondent No.2 (complainant), who has filed an affidavit in this regard, wherein it is stated that the FIR was lodged on account of misunderstanding and misconception. The dispute has now been resolved with the help of friends, relatives and no ill­ will and grievances exist between the parties any more. It is further stated that respondent No.2 has no objection if the FIR in question and the resultant proceedings are quashed and set aside. 5. Mr.S.M.Shukla, learned advocate for the applicants, submits that in view of the fact that respondent No.2 no longer wants to proceed with the criminal litigation against the applicants and as the dispute has been amicably resolved, the prayer made in the application may be granted. 6. In support of his submissions, learned advocate for the applicants has placed reliance upon upon the judgments of the Supreme Court in the cases of Madan Mohan Abbot v. State of Punjab reported in (2008)4 SCC 582 and Gian Singh v. State of Punjab And Another reported in (2012)10 SCC 303. 7. Mr.L.B.Dabhi, learned Additional Public Prosecutor for respondent No.1 has submitted that the Court may permit the law to take its own course by not granting the prayers made in the application. 8. Mr.Anil C.Thakore, learned advocate for respondent No.2, has reiterated the stand of the said respondent, as stated in the affidavit and has submitted that the dispute has been amicably settled between the applicants and respondent No.2 with the help of friends and relatives and no ill­will and grievances exists amongst them any longer. The FIR has been filed due to misconception and misunderstanding which has been sorted out. Respondent No.2 has, therefore no objection to the granting of the prayers made in the application. 9. The complainant is present in­person in the Court today and has been identified by his learned advocate. He has reiterated the stand taken by him in his affidavit and has stated that he has no objection if the FIR, and the resultant proceedings are quashed and set aside. 10. In view of the above stand taken by the complainant and taking into consideration the affidavit filed by him, it appears that the dispute between the applicant and the complainant has been resolved amicably and the complainant no longer wants to pursue the criminal litigation. Under the circumstances, no fruitful purpose would be served by compelling the applicants to face trial. 11. In Madan Mohan Abbot v. State of Punjab (supra), the Supreme Court has held that it is advisable that in disputes where the question involved is of a purely personal nature, the courts should ordinarily accept the terms of compromise even in criminal proceedings, since keeping the matter alive, with no possibility of a result in favour of the prosecution, is a luxury which the courts, grossly overburdened as they are, cannot afford. The time so saved can be utilised in deciding more effective and meaningful litigation. 12. This position of law has been reiterated in a more recent judgment of the Supreme Court in the case of Gian Singh v. State of Punjab And Another (supra). The FIR, being C.R.No.I­204/2014, registered with Vatva Police Station, Ahmedabad, for offences punishable under Sections 306, 498A and 114 of the Indian Penal Code as well as Sections 3 and 7 of the Dowry Prohibition Act, 1961, and all consequential proceedings arising out of the same, are hereby quashed and set aside. Applicant No.2 – Aakashsinh Arvindbhai Rathor shall be released from the Central Jail, Sabarmati, Ahmedabad, upon production of a copy of this order, if not required in any other case. 14. The application is allowed in the above terms. Rule is made absolute, accordingly. 15. Direct Service is permitted. This entry was posted in where is the evidence on July 15, 2015 by vinayak. Quash rejected by HC, even after Husband wife compromise on a 498A case !! Slowly, fire and milk 498a cases are becomming a BAD idea !! In this case, the husband who is convicted of 498a at the lower court, files an appeal at the sessions court and then enters into a compromise with wife. So he files for a quash before the HC. The Hon. Jarkhand HC also refuses to quash the case, citing a Supreme Court judgement! So, filing false cases and compromising in the name of a compromise seems to be a bad bad idea now !! 13.07.2015: This application has been filed for quashing the order dated 12.11.2014 passed by the learned District & Additional Sessions Judge-1, Godda in Cr. Appeal No. 02 of 2013 whereby and whereunder , he rejected the joint compromise petition filed by the parties for disposing of the criminal appeal in pursuance of compromise. It appears that the petitioners have been convicted and sentenced by learned Judicial Magistrate, 1 st Class, Godda in P.C.R. No. 840 of 2005 whereby and whereunder he convicted the petitioners under section 498A of the Indian Penal Code and sentenced them to undergo R.I. for 3 years and also directed to deposit fine of Rs. 5,000/- and in case of default of payment of fine, petitioners have been further directed to undergo a sentence of 6 months S.I. It appears that after the conviction, both the parties have settled their dispute out side the court and filed a joint compromise petition in the lower appellate court of learned District & Additional Sessions Judge-1, Godda and the learned District & Additional Sessions Judge-1, Godda has rejected the aforesaid compromise petition vide order dated 12.11.2014 on the ground that the offence under section 498A of the I.P.C. is not compoundable, therefore, the said compromise petition is not maintainable. Against the aforesaid order, this application filed. It is submitted by Sri K.P. Deo, learned counsel for the petitioners that the dispute between the parties is matrimonial and private in nature, thus, this Court can accept the compromise and quash the conviction pending in the learned lower appellate court, in exercise of power contained under section 482 of the Cr.P.C.. In this relation, learned counsel for the petitioner relied upon three single Judge judgment of this Court in Heeralal Prasad Verma & Ors V. State of Jharkhand & another reported in 2006CRI. L.J. 778, in Subhash Agarwal @ Subhash Kumar Agarwal & Anr Vs. State of Jharkhand and another reported in [2012(2)East Cr. C 144(Jhr)] and in Kanti Devi Vs. State of Jharkhand and another reported in [2012(2)East Cr. C 85(Jhr)]. On the other hand , Sri Rakesh Kumar, learned Additional P.P. appearing for the State submits that once conviction has been made in a non -compoundable case then on the basis of compromise, conviction cannot be quashed under section 482 of the Cr.P.C. He relied upon a judgment of Hon’ble Apex Court in Manohar Singh Vs. State of Madhya Pradesh reported in [2014 0 CrLJ4326]. The contention of learned counsel for the petitioner that since the offence under section 498A of the I.P.C. is matrimonial and private in nature, therefore, in exercise of power contained under section 482 of the Cr.P.C., the conviction of the petitioner passed by the court below can be quashed, is on the teeth of recent judgment of Hon’ble Supreme Court in Manohar Singh Vs. State of Madhya Pradesh case ( supra) . Thus, in view of the aforesaid judgment of Hon’ble Supreme Court, the single judge judgment of this Court as referred herein above have no application because the said judgments had not taken into account the judgment of Hon’ble Supreme Court in the above case. Considering the aforesaid facts and circumstance, I find no merit in this application. Accordingly, this application is dismissed. This entry was posted in 498a, 498a quash, JHARKHAND HC, no quash even after compromise and tagged 498a, 498a quash, JHARKHAND HC, No quash even after compromise on July 15, 2015 by vinayak.